Dendrobium papilio large form sibling cross #2275 ('Stony Point' x 'Judy') (approximately 25 seedlings per flask). 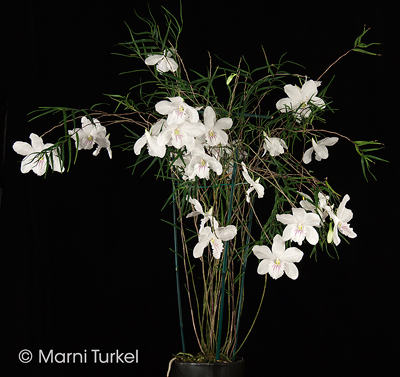 The Species: This is a very choice form of the delightful Dendrobium papilio. The plant and flowers of this form are about twice the size of the normal form. So the flowers on the large from have a natural spread of 4.25" and on the normal form they are 2.25". 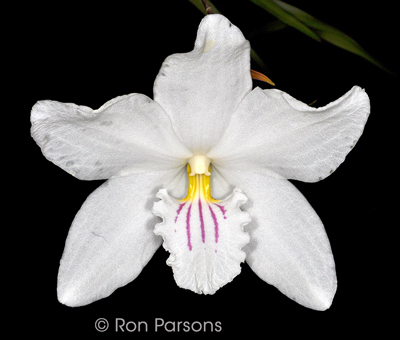 The species is found in the Philippines at elevations 4600 to 7250 ft where it grows as an epiphyte. 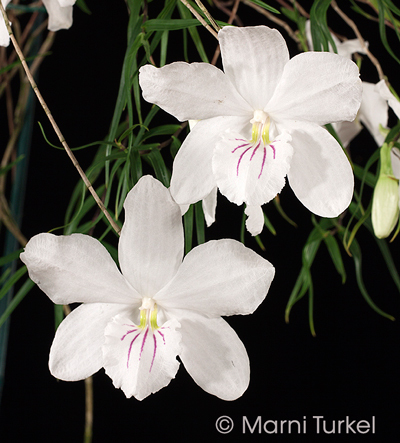 The growths are slender and the fragrant flowers appear to float in the air like butterflies. Culture: This does best for me in a cool greenhouse (50F minimum nights) potted in a bark mix. I usually add a bit of oyster shell on top of the mix, though I am told that it isn't necessary. It can also be grown mounted. Whether potted or mounted, the growths will arch out under the weight of the proportionally large flowers and may need staking unless the are where they can just spread out. Either way it is a magnificent sight in full bloom. I water year round with dilute fertilizer. It is growing in moderate light.